I saw this recipe on the Martha Stewart show and it looked so easy and yummy that I decided to give it a whirl last weekend. -Whisk together eggs and Parmesan in a large bowl. -Cut salami into 1/2-inch strips. Heat a skillet over medium-high, then coat with olive oil. Cook salami and garlic until salami is crisp. 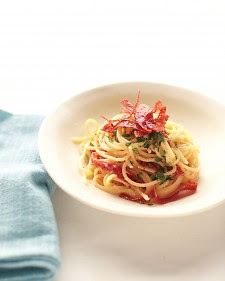 -Cook spaghetti; before draining, reserve 1 cup pasta water. -Add hot pasta to egg mixture, along with garlic and half the salami. Toss, adding enough pasta water to coat pasta in a creamy sauce. -Season with salt and pepper, if needed. -Serve topped with a sprinkle of parsley and remaining salami. This looks so yummy! Thanks for the recipe.